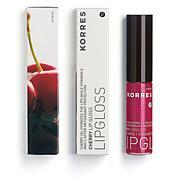 Help soften and hydrate your lips with a quad of full color cherry oil lip glosses from Korres. Ingredients: Polybutene, Hydrogenated Polydecene, Synthetic Wax, Silica, VP/Hexadecene Copolymer, Octyldodecanol, Simmondsia Chinensis (Jojoba) Seed Oil, Anise Alcohol, Aroma (Flavor), Ascorbyl Palmitate, Citric Acid, Lauryl PCA, Lecithin, Phenoxyethanol, Prunus Avium (Sweet Cherry) Seed Oil, Prunus Cerasus (Bitter Cherry) Seed Oil, Tocopherol, Calcium Aluminum Borosilicate, Synthetic Fluorphlogopite, [+/- (May Contain/Peut contenir): Mica, CI 15850/Red 6, CI 15850/Red 7 Lake, CI 15985/Yellow 6 Lake, CI 45410/Red 28 Lake, CI 77491/Iron Oxides, CI 77492/Iron Oxides, CI 77499/Iron Oxides, CI 77891/Titanium Dioxide]. This gloss is moisturizing and stays on so well. I had the red and coral and reordered as liked so much. It really lasts and looks so nice on. The lip gloss is awesome. My lips feel soft! Great lip glosses and love the colors. I have very dry lips and these glosses are the best. Thank you Korres and HSN! 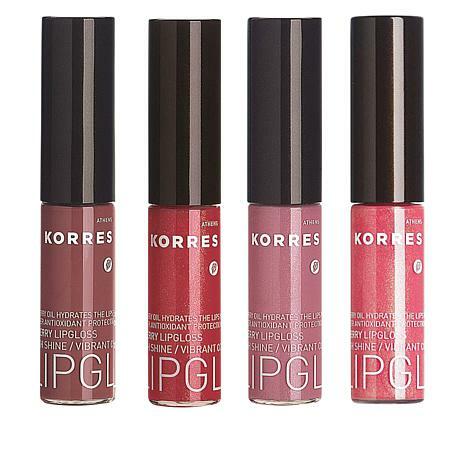 Great lipgloss set, the colors are beautiful and give a really nice shine to the lips. 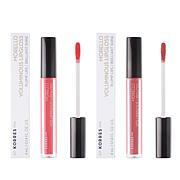 After the gloss wears off my lips feel soft and hydrated, these are not drying or gritty feeling. The color doesn't stay long but the moisturizing benefits do.